In 2012, the San Martin community in Costa Rica endured a magnitude 7.8 earthquake which left much of its infrastructure either destroyed or brutally damaged. The majority of the school’s infrastructures, particularly the school walls and roofs, endured heavy damage and was in need of considerable repair. 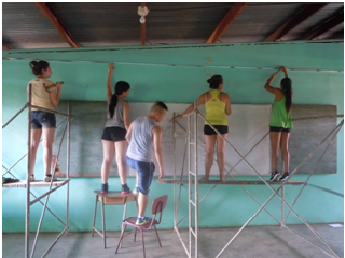 Thus, this past summer, I was given the opportunity to lead a team of 10 amazing participants to the first outreach trip hosted by Ryerson SOS to repair the severely damaged school in San Martin, Costa Rica. When I came back from Costa Rica, the most common question people asked me was: “Would you do this again?” And in 30 seconds, the whole two weeks of the outreach trip flashed through my head. No, it was actually months of planning plus the two weeks that flashed through my head, but that’s beside the point. Anyway, I just instantly remember the heat, the sweat, and the mosquito bites – lots of mosquito bites. I remember a lot of early mornings and late nights. I remember my whole body being sore from all the lifting, shovelling, and carrying. I remember having dirt, cement and paint all over me and my clothes. But I also remember the great teamwork shown on the trip where people would work overtime just to finish some of the tasks. I remember how hard the NGO leader and the foreman worked alongside us, as they were only a few of the wonderful people that I met in the mere two weeks. I remember the students at the school coming up to us asking for our phone numbers and autographs like celebrities. The children would ask us to join them in a game of soccer, braid our hair, and help us with our tasks. It was insanely sweet when a little boy came up to me and helped me lift this heavy bucket – this 8-10 year old little boy decided to help me carry a bucket that’s half his size. I remember when randomly a swarm of little girls just suddenly attacked me with hugs and kisses to the cheek. When I saw all the children, whom make it so hard not to fall in love with them at first sight, I knew I made the right decision. The two ramps that we built that connect the gym to the main hallways of the school will help generations of children with disabilities participate in activities at the gym. 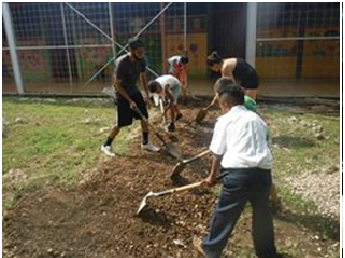 The wall that we repaired will make the classroom a safer environment to learn in. The roof that we repaired and replaced will make the classroom a cooler space to be in (because we all know how hot it can get in Costa Rica). The walls we painted brightened the school atmosphere. It’s definitely a lot of hard work, but it’s all worth it. You get back what you give – yes, you do work very hard, but what you get back is something that you cannot receive from anywhere else. It is an experience of a life time; it is that personal fulfilment that you feel when you have truly made a difference in people’s lives for generations. Before leaving, a bunch of the teachers took us out for dinner and thanked us, and I cried like a big baby (which is rare – I’m not much of a crier). I cried because it just makes my heart smile (forget me for my lack of better descriptions) how appreciative the teachers were, especially when they didn’t realize how much the students and staff have given us. They made us feel part of their community, and because of that warmth and acceptance, I learned so much from their culture. One of the major things that inevitably stuck by me was “pura vida” which is a phrase that is commonly used in Costa Rica. It literally means “pure life” but can also mean going great, real living, this is living and so on. It can be used as a greeting, a way of saying thank you, or even saying goodbye. Even if the conditions are bad or things aren’t going so well, they would simply say “oh pura vida!” and move on. The people are so positive and that positivity they carry around is absolutely contagious! It puts a lot into perspective that we don’t really need that $500 pair of shoes or that new iPhone to truly enjoy life. We simply just need to appreciate everything that life have given us, and move past all the hardships that we may face. This is a lesson that I learned from my time in the San Martin community and is something I will carry around with me for the rest of my life. So would I do this again, you may ask? Without a doubt, in a heartbeat, I would do this again… and again, and again. 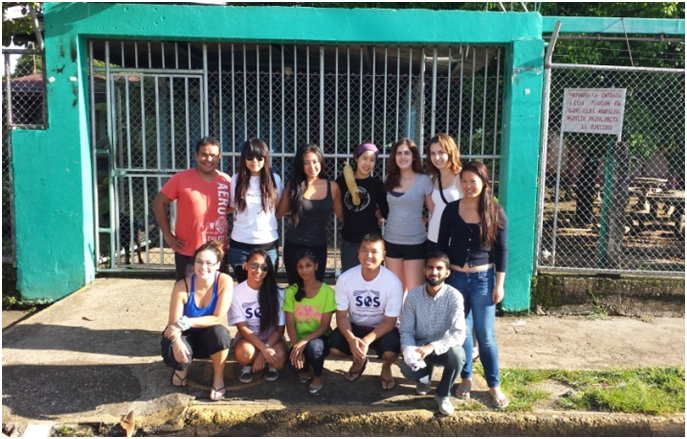 Wondering how you could join me for Ryerson SOS’s next outreach trip? Ryerson SOS will be hosting our first Outreach Trip Info-Session of the year! 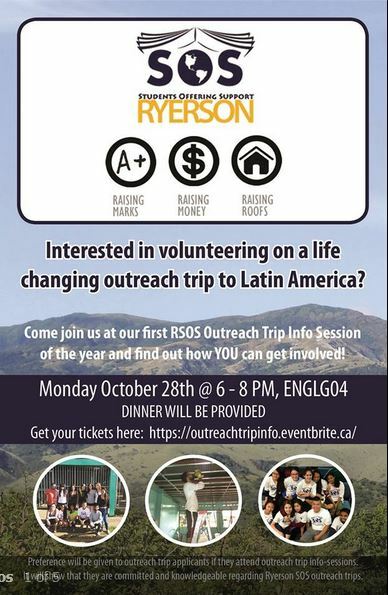 Come join us on October 28th, 2013 from 6-8pm at ENGLG04 to learn more about the annual outreach trips that Ryerson SOS hosts and how YOU could get involved! There will be detailed information provided about what an outreach trip is all about, and special testimonies from previous trip participants! The deadline to get the tickets is Sunday, October 27 at 11:59pm! The event is free! Dinner will also be provided. There is limited space available so sign up fast! *Preference will be given to outreach trip applicants if they’ve attended outreach trip info-sessions. 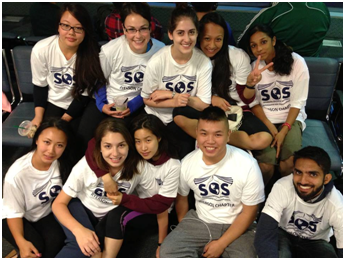 It will show that they are committed and knowledgeable regarding Ryerson SOS outreach trips. Ryerson Students Offering Support (Ryerson SOS) is a student-led charitable initiative that seeks to provide assistance to students local and abroad. The mandate for Ryerson SOS involves three key processes: raising marks, raising money, and raising roofs. These three components represent the chain of events through which Ryerson SOS operates. The money raised from our services of raising marks, such as mock exams and exam-aid sessions, are used to fund the completion of an educational project in the span of two weeks in a Latin American community.